Grab an sE Electronics guitaRF reflexion filter and get the isolated guitar cabinet sounds you’ve always wanted, without the hassle or expense of building an isolation booth. The guitaRF is extremely simple and easy to use. 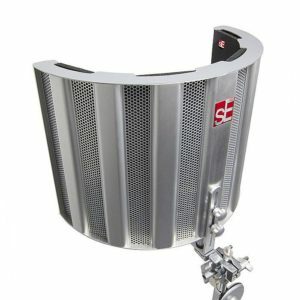 In addition to a mounting bracket, which lets you support or suspend your favorite condenser or ribbon mic, there’s a hole in the filter that’s the perfect size to stick an SM57 or similar-size dynamic just off center of the filter itself. The result is that you can stick one mic on center and another off axis, all while blocking out room reflections and keeping both mics in phase. Its special flat base lets you slide the guitaRF right up to your amp for extreme close miking, and the whole structure is height adjustable, so you can line your mics up with the sweet spot of your guitar cab. What an elegant and simple way to improve the sound of your acoustic space! Not everyone has the budget or the space to work in a perfectly “tuned” and treated acoustic space. But that doesn’t mean you can’t sound great. 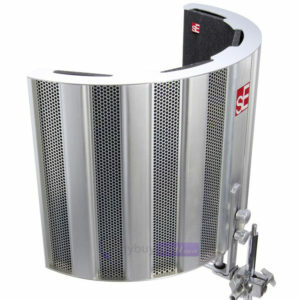 Believe it or not, sE Electronics’ Reflexion Filter does an amazing job of making your mic sound better, because its six different layers diffuse the sound waves around the mic. 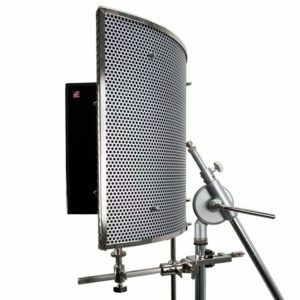 Better yet, it mounts to any mic stand – you can take this portable acoustic treatment into other rooms or to other locations! The Reflexion Filter costs a fraction of what a full-room treatment would cost, and it does an outstanding job taming the reflections in the room. If you record, you’ll want this on your favorite mic! 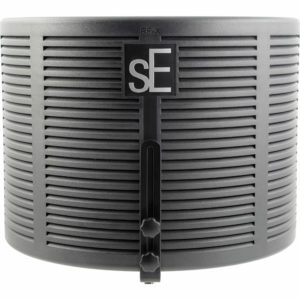 The sE Electronics SPACE mic isolation filter gives you incredible acoustic control, allowing you to minimize sonic reflections in your mic for cleaner, more distinct recordings. Based on their acclaimed Reflexion Filter, SPACE features 10 layers of different materials designed to absorb sound that would normally reflect back into your microphone. The result is tighter bass, more detailed mids, natural highs, and an all around better sound. 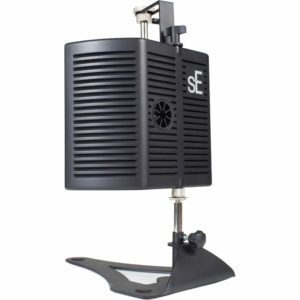 No matter where or what you’re recording, you’ll capture a better sound with the sE Electronics SPACE acoustic filter on your mic stand. 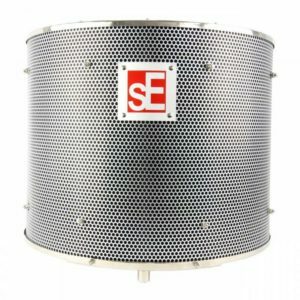 The sE Electronics Reflexion Filter X gives you access to sE’s patented acoustic filter technology at an incredibly affordable price. For the RF-X, sE developed new materials that are lightweight yet rugged enough to stand up to the most demanding work environments. An outer composite panel, a wool fabric layer, an air gap layer, and an inner acoustic foam layer form a unique, 4-layer design that imparts near-zero sonic coloration to your tracks. 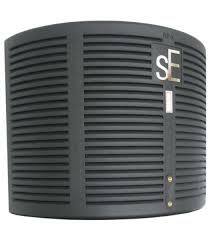 Get great-sounding recordings without breaking the bank, with the sE Electronics Reflexion Filter X.